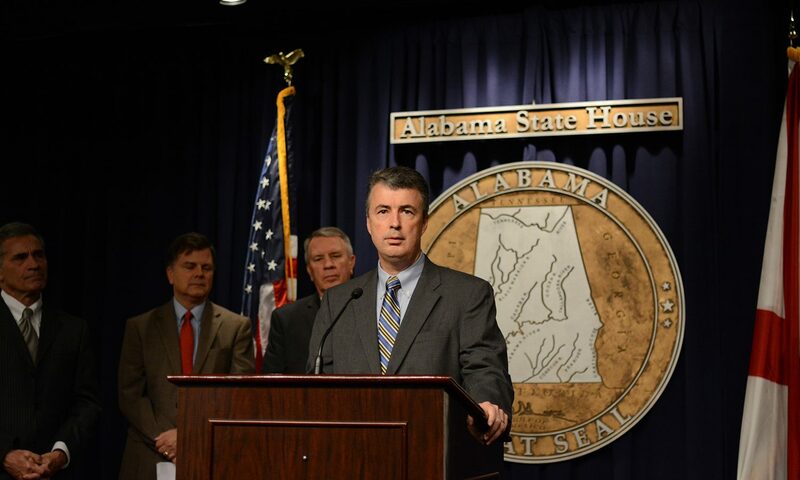 Montgomery County District Attorney Daryl Bailey has recused his office from an investigating Alabama Attorney General Steve Marshall over allegations that he accepted illegal campaign contributions. Bailey confirmed to APR that he sent a letter to Gov. Kay Ivey informing her of the recusal, which is based on potential conflicts of interest stemming from Montgomery DA’s office and the AG’s office working closely on several routine matters. It will now be up to Ivey to determine how, or if, the allegations against Marshall — which were made by two practicing attorneys— will be investigated. Ivey could assign the case to another DA or appoint a supernumerary DA to investigate. Asked if his decision to present the allegations to Ivey and explain his office’s recusal was an indication that he felt the allegations warranted an investigation, Bailey said he would leave that determination to Ivey. Ivey’s office acknowledged receipt of Bailey’s letter but did not comment further. The allegations against Marshall are well known and were a major point of contention during last year’s elections— both in the primary and the general. And, in fact, it was his Republican challenger in the race for attorney general, Troy King, who initially filed an ethics complaint over the campaign donations. Those donations — more than $700,000 — came from the Republican Attorneys General Association, a federal political action committee. Alabama law prevents candidates for public office from accepting donations received from PACs that participate in PAC-to-PAC transfers, which are designed to mask the identity of the original source of funds. As a federal PAC, RAGA isn’t subject to Alabama law, so it routinely makes and receives transfers from other PACs. This fact first came to light two years earlier, when then-AG Luther Strange was forced to return a large RAGA donation out of fear that it would violate the state’s ban on candidates receiving money from a PAC that participates in PAC-to-PAC transfers. Marshall was aware of this history, but he still accepted the money. And the AG of Alabama then argued that it was legal because RAGA isn’t subject to Alabama law. But the law also mandates that candidates return the money within 10 days or face a penalty up to being charged with a felony, making it clear that the candidate has a responsibility to honor the PAC-to-PAC ban. Late last year, the Alabama Ethics Commission cited “a lack of evidence” in voting not to refer the allegations against Marshall onto a DA for prosecution. However, commissioner Charles Price — a former and longtime circuit court judge in Montgomery County — stated clearly that he believed the law had been violated by Marshall and Price voted to have him prosecuted.